A dental implant is a replacement tooth that is attached to a titanium post. A dentist permanently implants the titanium post into the jaw to replace a missing tooth. Dental implants look and feel natural. The dental implant procedure is a multi-stage treatment. The titanium post fuses to your jawbone, giving the replacement tooth added strength and support. 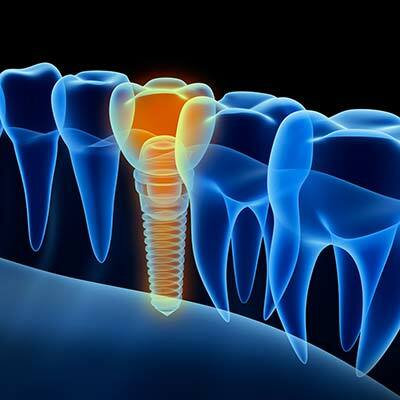 Implants can also help support adjacent teeth and prevent bone loss in healthy patients. Dental implants are ideal for patients who have healthy gums and bone structure. Patients who smoke experience a high rate of failure for dental implants, so the procedure isn’t recommended for active smokers. The process of placing and fusing a dental implant can take 3-6 months. Once the implant has successfully fused into the bone, the dentist attaches a special post to the implant and attaches a custom-designed crown to the post. Patients care for dental implants just like they care for their natural teeth. Proper brushing and flossing can help ensure a good, long-term result.